Helps Protect Patient's Eyes and Facial Nerves During Spinal Surgery! Disposa-View™ is the only completely disposable Head Positioning Device available! Other products consist of reusable platforms or mirrors, while the Disposa-View™ is simply discarded after use. 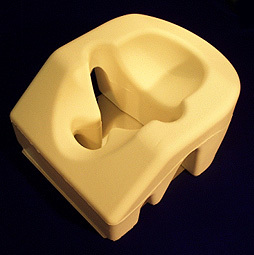 The Disposa-View™ is designed to protect the eyes and face of the prone patient. The soft comfortable foam provides soft comfortable support while reducing the pressure on the patient's eyes and face. The potential for eye injuries is reduced substantially. The mirror allows the anesthetist to monitor the patient's face, eyes, and the endotracheal tube. The slotted design allows for breathing circuits and endotracheal tubes to be placed on either side of the patient's face.